Life is Sweeter when it’s wholesome! Love, kindness and joy may not appear on our ingredient label, but they’re in this package just the same. Each time you choose Wholesome! products, someone’s life gets a little sweeter. We are committed to Non-GMO food and stay on the cutting edge of eco-friendly agriculture to ensure the smallest footprint possible. Zero is produced from all natural erythritol, a naturally occurring sugar found in our bodies, fruits and fermented foods. It has a clean sweetness, is tooth-friendly, and is an ideal replacement for artificial sweeteners. Zero is perfect in beverages or desserts where you prefer a delightfully mild rather than intense sweetness. Not significant source of Calories from Fat, Saturated Fat, Trans Fat, Cholesterol, Dietary Fiber, Vitamin A, Vitamin C, Calcium and Iron. 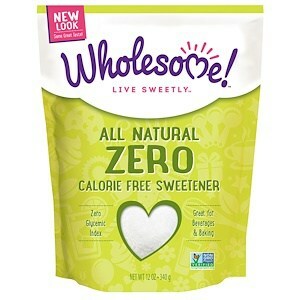 All Natural Zero Calorie Free Sweetener, 12 oz (340 g), Wholesome Sweeteners, Inc.